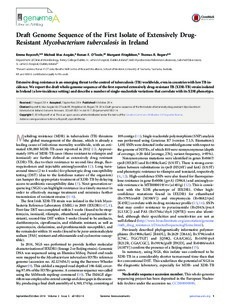 Copyright 2014 The Authors-This is an open-access article distributed under the terms of the Creative Commons Attribution 3.0 Unported license. (CC BY 3.0). Extensively drug-resistant (XDR) tuberculosis has now been described in >90 countries worldwide. The first case of XDR tuberculosis (XDR-TB) in New Zealand was recorded in 2010. We report the draft whole-genome sequence of the New Zealand isolate, NZXDR1, and describe a number of single-nucleotide polymorphisms that relate to drug resistance.